Notes: Recipe by No. 2 Pencil. All my notes will be in bold. 1/2 cup of red wine KB: Don’t need anything fancy. Use the cheapest red wine you can find. I ended up using a $3 bottle of Merlot. KB: Consider adding some soy sauce and/or Worcester sauce. The Au Jus was missing something. For best results, let chuck roast rest at room temperature for at least 15 minutes before searing. Add vegetable oil to the Instant Pot and hit the sauté button. Season chuck roast with 2 teaspoon of kosher salt, freshly ground pepper to taste and 1/2 teaspoon of garlic powder on all side. KB: See item 3 in the notes at the bottom of the page. Using a pair on long heat-proof kitchen tongs, sear roast on all sides in Instant Pot. Remove seared roast from Instant Pot and set aside. Add onions to pot and sauté just until they start to soften. Add red wine to pot and let simmer until reduced by half. Use a wooden spoon to scrape up seared bits from the bottom of the pot as it simmers. Once wine has reduced, add low-sodium beef broth and bay leaf. Return roast to Instant Pot, close lid and make pressure release valve is set to sealing. Hit Meat/Stew function and increase time to 100 minutes. Let Instant Pot natural release for 25 minutes, then turn valve to venting to release any excess pressure. Remove lid and transfer roast to a serving plate and shred. Strain liquid through a fine mesh strainer and serve warm for dipping sandwiches. KB: Definitely do this. The cooking process made the onions super mushy and you don’t want to use them in your sandwich. Set oven to broil and place sandwich rolls on a baking sheet. Combine melted butter, 1/4 teaspoon of garlic powder and pinch of kosher salt in a small bowl. Brush over rolls and toast 2-3 minutes, just until gold brown. Pile meat onto rolls and top with cheese. Return to broiler and heat just until cheese has started to melt. Top sandwiches with freshly chopped flat-leaf parsley and serve with warm au jus for dipping. I thought this recipe was really good. Like I mentioned above, the Au Jus sauce wasn’t quite right. It seemed to be missing something. I’ll be adding some Worcester and Soy Sauce (or maybe fish sauce) next time to get the dipping sauce to where I would like it. Might be worthwhile to splurge the $1.60 (at Safeway) for the McCormick’s Au Jus spice packet. Instead of cooking a whole beef chuck, next time, I’ll try cutting the chuck into smaller pieces and cooking for 60-65 minutes instead of the 100 minutes that this recipe calls for. I don’t see any real benefit to cooking the beef as a whole. The smaller pieces would be easier to handle and will cook quicker. 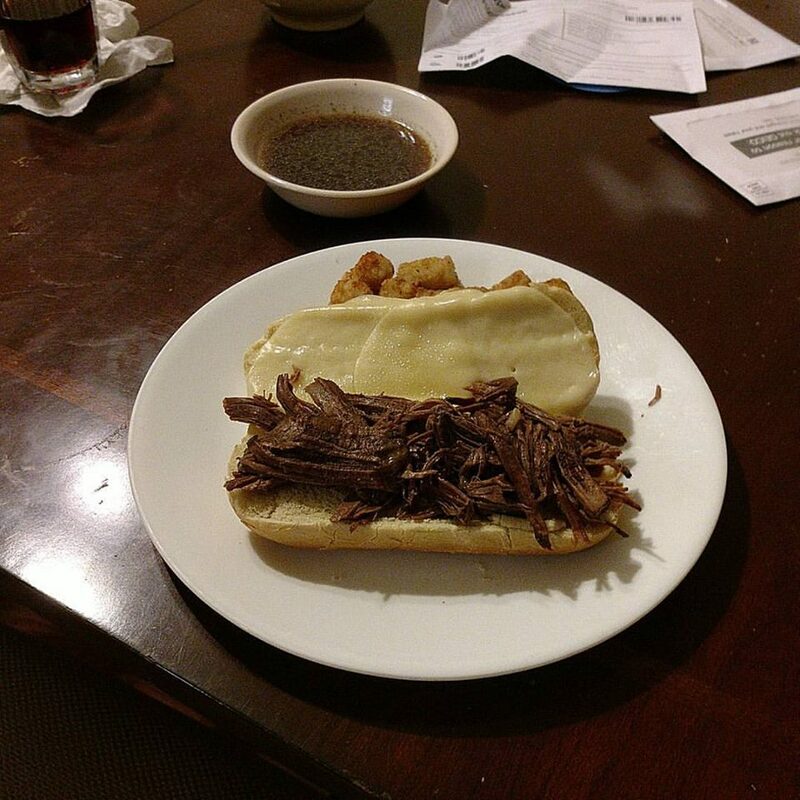 This entry was posted in Food, Uncategorized and tagged beef, comfort food, cooking, instant pot, sandwiches by Kevin. Bookmark the permalink.